Infinity therapists Lisa and Vanessa performing Hydrafacial treatments at the Vogue Beauty and Anti-Ageing event in Sydney 18th March 2017. HydraFacial MD® is a gentle, non-invasive, multi-step skin resurfacing treatment. It combines the exfoliation benefits of next-level hydradermabrasion, a chemical peel, automated painless extractions (without the pinching!) as well as the simultaneous concentrated delivery of skin nutrients such as antioxidants, hyaluronic acid and peptides. It does all of this in one quick session, delivering visible results without the abrasiveness that is associated with the older technology used for microdermabrasion treatment or the downtime required from some other types of treatments. HydraFacial MD® is pain free and takes just 30 minutes, so you can easily incorporate it into your work day. For best results, a series of three sessions is recommended. Your skin is at its most beautiful when it is healthy and hydrated. That is why our focus is on restoring your skin to its healthiest state by removing impurities and replenishing your skin with essential nutrients. The result is that you will not only look better, but also immediately notice a dramatic shift in the health of your skin. 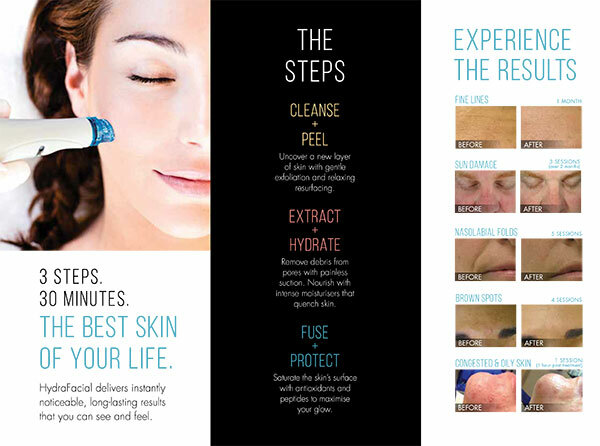 Loved by the medical community, beauty editors and celebrities alike, the HydraFacial MD® resurfacing procedure is a next-level non-invasive treatment that utilises award-winning, patented technology to detoxify, rejuvenate and protect your skin more gently and more effectively than the older-style microdermabrasion treatment. It delivers immediate results and long-term benefits without downtime or irritation. To experience the HydraFacial MD® for yourself, call our friendly team at Infinity Skin Clinic today at Mosman on (02) 9307 2833 or Surry Hills on (02) 8056 8157.